PresidentofVirtualReality.com - Offical Site for the President of Virtual Reality. Visionary entrepreneur Jon NEVERDIE Jacobs, has been elected the first-ever President of Virtual Reality in the officially sanctioned election hosted by Swedish VR developer Mindark PE AB and supported by a coalition of game developers. NEVERDIE was elected when the polls closed at midnight on March 27th, receiving over 70 percent of the vote. The online election ended in conjunction with the debut of the March 28th bow of the highly anticipated Oculus VR platform. "Virtual reality is the greatest discovery since America and there are no limits to how great it can become," stated NEVERDIE Jacobs in his first official remarks. "Humanity must keep pace with Artificial Intelligence as it's essential to replace the jobs that are being lost. We can only win the first battle by acting fast and investing in virtual infrastructure to create new jobs. Most importantly the borders are open for all entrepreneurs, pioneers, refugees and even real world governments looking to address the disruption caused by rapidly advancing technology." "Through wide adoption of avatar skills as currency and a unified commitment to a secure global virtual goods marketplace, we can instantly disrupt the multibillion dollar video game industry to the point where people will choose the games to play based upon how much they can earn for their time and skills playing. This model will lead to massive increase in the GNP of Virtual Reality Worlds and fuel the trillion dollar VR industry, ultimately benefiting developers, users and investors alike." 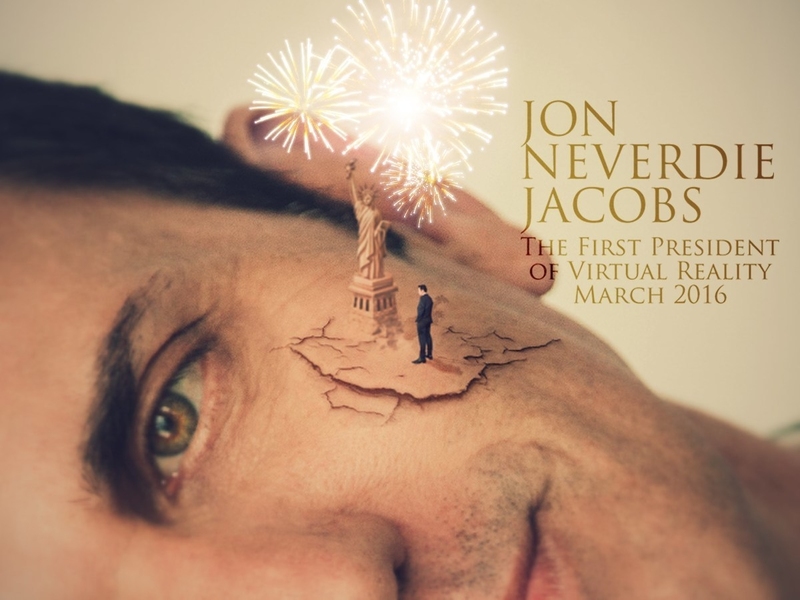 Jon NEVERDIE Jacobs has been at the frontline of pioneering Virtual Worlds for over a Decade, setting Guinness World Records for valuable virtual items and working with major Hollywood studios to bring pop culture to Virtual Worlds. His Campaign pledge in the election for the first President was to create one BILLION jobs in Virtual Reality during his initial 4 Year term in office. The exploding Virtual Reality industry is projected to generate revenues of $200 billion per year by 2020. In conjunction with assuming Presidency of VR, NEVERDIE Jacobs has been selected to attend the Singularity University Executive Program where he will join a community of innovators from around the world working together to understand utilize the exponential advances in technology, science and medicine to address global challenges. The Singularity University was co-founded by celebrated futurist Ray Kurzweil who is now the Director of Engineering at Google and Peter Diamandis who is also the founder of XPrize foundation. As part of this landmark new initiative – hardware and software developers, publishers and creators are encouraged to join the Virtual Reality Coalition in support of the creation of the Avatar Bill of Rights as a means to galvanize the VR community. © 2016 President of Virtual Reality. All rights reserved.